Interviewing for an open job, even at a staffing company, does not guarantee you’ll get hired. I know it seems like because we place people in jobs for a living that you should get one just for walking in the door. But we have hundreds of applicants sometimes for each open position and when we call you in for an interview, that’s exactly what you have to do – interview. Your odds can even be better at a staffing agency if you approach the interview correctly. Read why we can help you have Better Odds. Our tip: treat every interaction with a staffing agency like you would with a direct hire employer. We would love to give every applicant a position, but our overall goals are to find career placements, meaning we find long-term positions that our candidates want to work at. If we just throw people into the first open position we have, no one would be happy. So, when you go to an interview, start with these three easy tips to wow a recruiter! The biggest mistake we see made at interviews is not dressing the part. Whatever position you’re interviewing for, dress one step up. That’s not to say you can’t wear jeans for a cleaning position, but you should wear a button up shirt or blouse and the jeans should be clean, hole free and well-fitting. Office positions should always be business casual. Respect has many different aspects. First and foremost, show up to your interview and be on time. If something comes up that causes you to be late or miss the interview, be respectful enough to call and let the recruiter’s office know as soon as you can. Respect extends into the interview as well. Unless you have an emergency, there’s no reason to have your phone out during the interview. Best practice: turn it on silent and put it away. 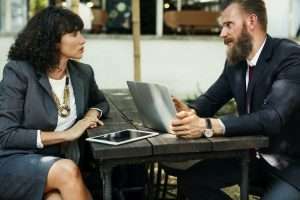 A frustration for many recruiters is asking any question in the interview process and getting the answer “I don’t know.” To avoid answering that way, prepare for your interview ahead of time. First, bring an updated resume. Make sure all dates of employment are correct and expect to answer questions about the job you did there. It wouldn’t hurt to have bullet points on your resume for each position. Also, prepare to answer questions about WHY you want to do that job and know a few things about the company you’re interviewing for. It shows interest in the job and that alone can signal to a recruiter you might be the best fit. If you need help creating or updating your resume, read our post on Resume Writing. 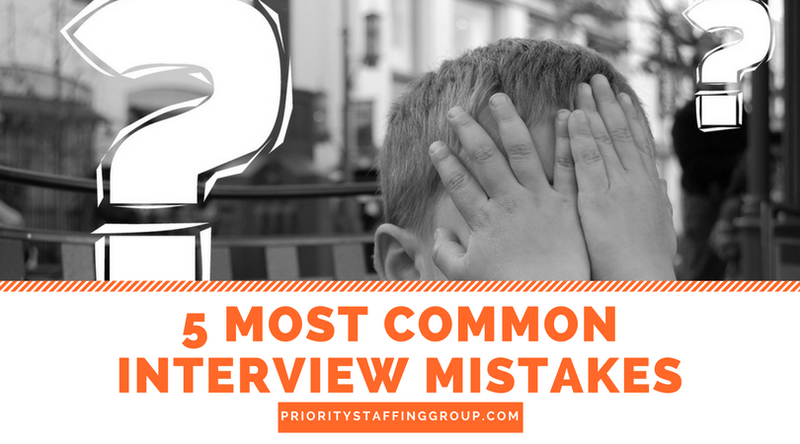 These three tips you just read are a great start for interview success, but if you want to really impress your recruiter, read the 5 Most Common Interview Mistakes to avoid. If you have more questions on Interview Techniques, we are happy to do coaching sessions at any of our locations. This year we have had things that seem a little off, especially with the weather. Single digit temperatures, lots of rain, and that groundhog… I know I am so ready for springtime and the time change, causing longer days. Now, as far as business goes, things have taken off out of the new year gate! Companies need staff and we are working hard a Priority Staffing Group, Ltd. to work though the qualified applicants. However, one thing that keeps happening: applicants do not seem to have the desire to clean up and dress for success. Please, if you know anyone looking for work, remind them that they need to present themselves in a clean and neat manner. First impressions still make a difference. We only get one chance to give a first impression. It is important to educated people and remind them what it takes to get an opportunity for employment. Employment is not guaranteed to anyone. You must work to be selected and then work to prove you are the best fit for the position. Let’s work together to educate our applicants. It only takes a minute to give advice on something that can set someone closer to the top of the applicant ladder. Priority Staffing Group has locations in Marion, Illinois; Vandalia, Illinois; and Murfreesboro, Tennessee. Please check out our job board that is updated daily to submit an application. From a recruiter standpoint, you might have been able to easily avoid that disappointment and start the job of your dreams. Read our five tips on identifying interview mistakes and how you can do better next time. Your interview starts before you get there. It’s more than wearing clean clothes; it’s wearing your best clothes. That old saying “Dress for Success,” is about job interviews! As a rule of thumb, you should dress one step up for the job you’ve applied for. You’re going to make an impression to the recruiter, so it might as well be a good one. 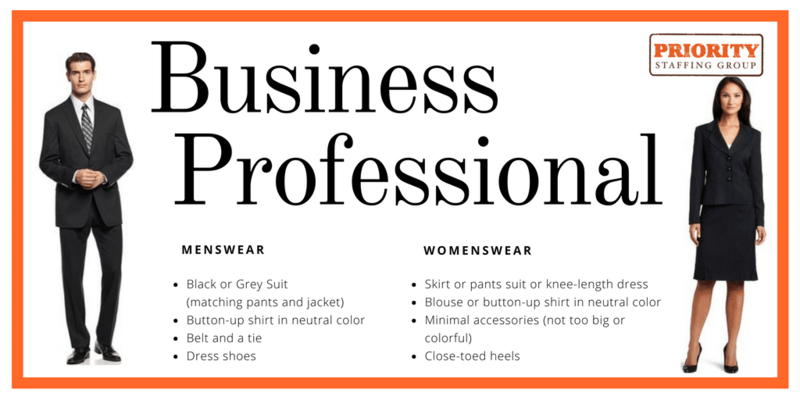 Read about Interview Attire if you need more tips on what to wear. One of the biggest pet peeves a recruiter has is waiting for an interview to show up. A lot of job seekers seem to think that the company is lucky to be interviewing you, but really, we don’t have to give you the job or even keep our appointment if you don’t show up on time. We likely have several other appointments that day and if you’re late then the rest of our appointments will have to wait. Don’t be the person that causes frustration because you can’t arrive on time. When you schedule the appointment, make sure to put the time in your calendar. The day of your interview, set an alarm to wake up on time. Plan enough time to get dressed and be at your interview about ten minutes early. Being punctual will make a great first impression! *Tip: If you have a legitimate reason for being late, call as soon as you can to let them know and ask if they’d like to reschedule if it’s going to throw off their day. The more flexible you can be for your recruiter, the better impression you’ll give. One reason recruiters turn down candidates for employment is because they didn’t pay attention during their interview. That sounds obvious, right? But one of the biggest distractions we see during an interview is cell phones. One of the biggest interview mistakes is using your phone, and yet, we see this happen all the time. Scrolling Facebook or Instagram and checking your email can wait until you leave. Another big mistake we see is not staying focused on the interviewers questions. By zoning out while the recruiter is talking, you’re showing them you can’t focus for even a half hour. Why would they trust you to stay focused when you’re on the job and working? Chances are, they typed your rejection letter when you weren’t listening. Do you want to show you were engaged in your interview? Try asking some thoughtful questions that show your interest. Read our Interview Question Dos and Don’ts for tips. Not bringing a resume, not knowing anything about the company, and not preparing answers to standard interview questions are all good ways to get turned down for the job. Remember, your interview starts before you get there. Plan a day in advance so you can print an updated copy of your resume, research the company website, and plan out what you might say if they ask “What is your biggest weakness?” It doesn’t take much extra time to be prepared, but those who do are much more likely to actually get their dream job. Those who don’t? Well, they’re still looking. Prepare by reading How to Write a Resume. Both talking too much and not talking enough can be red flags for the position you’re interviewing for. At an interview, you need to show you can interact with people appropriately. This is more important for some positions than others, but all interviews will judge your ability to listen and process information and then respond in a way that tells them what they want to know. You can identify and fix these five common interview mistakes BEFORE you go to an interview. Don’t let someone less qualified get the job you want simply because you didn’t put in the effort. For resume and interview coaching, call any of our offices. For those of us who have been on the candidate side of an interview, it can be difficult to answer the question about, well, questions. So what are interview question dos and don’ts? Read on for some suggestions on what to ask and not to ask in your next job interview. You probably came into your interview with some questions about hours, expectations of the job, reporting supervisor, etc. Asking questions they didn’t answer is the best place to start. It shows you have genuine interest in the job and what you’ll be doing at the company. Just make sure to focus on aspects that show you care about the right things, rather than how you can cut corners. As you prepared for your interview, you probably spent some time online gathering information about the company. That’s a great start, but what didn’t you find out? Did their website tell you how many locations they have, but not when the company was founded? Ask how long they’ve been in business. Did you find a detailed history of the company, but nothing about their current staff? Ask how many employees they have locally/regionally/nationally. Show an interest in the company you’re auditioning for and you’ll make a good impression. No one likes to start a job and find out on the first day that everyone there works in shared office space as a team, when you prefer to work independently, away from distractions. It is important to know what culture you’re coming into. Teams who like each other tend to work better together, making everyone’s job a little easier. Ask what kinds of team building activities they do as a company, but also ask about the business’ mission statement and if they have a set of Core Values. You’ll sound impressive to your interviewer and also get some inside info that other applicants probably didn’t think to ask. If this is your first interview at the company, don’t bring up salary or benefits unless the interviewer brings it up first. If they ask, it has opened up a door. But if they don’t, it probably isn’t their biggest concern and shouldn’t be yours either. Don’t make it seem like you’re only in it for the money, vacation time, insurance or 401K match. Business owners want to see that their employees are engaged in the work and their goals more than their compensation. Don’t ask about race, gender, marital status, age, religion, etc. of your interviewer or anyone else who works at that company. Just like you don’t want them to ask you about those things, it is inappropriate to ask that of them. Do I have to take a drug test? This question is a sure way to get rejected for a position. Even if the company doesn’t require drug testing, you have caused concern for your reliability and responsibility. Always be prepared to take a drug test for work, but never worry your interviewer about whether you’ll pass or not. Overall, be prepared to ask two to three good questions and shy away from asking anything too personal or too specific. If you need help preparing, Priority Staffing Group provides interview coaching and resume writing help to our applicants. We want to see our applicants succeed. Call any of our offices to find out how we can help connect you to your next opportunity. If you are looking for a new career opportunity, your social media presence, especially your LinkedIn profile, can play a very important role in your success. In Illinois it is actually illegal for employers to use social media in determining whether or not to hire someone. Employers can, however, use sites like LinkedIn to find qualified applicants and notify them of career opportunities. For this reason, you want to make sure your profile depicts you in an accurate and professional manner. If you’ve created your profile, but are not getting any attention, think about making a few changes. It could be that your profile does not portray a professional look. Unlike other social media platforms, LinkedIn is almost all business. Your profile, posts and comments should keep with that fact. For those of you struggling to gain traction on LinkedIn, here are some simple tips that you can implement today. With LinkedIn, it’s all about being professional. Therefore, your photo should depict a professional image, not an inappropriate, blank or casual one. Most phones now have a camera with high enough resolution to capture a good photo – so no excuses! Remember, your photo could be the first impression an employer has of you, so dress accordingly. Your headline should contain keywords that relate to the position you are seeking. Think about some of the most likely terms or phrases a potential employer looking to hire candidates might search for and add them to your profile. It will make you more visible to searchers. Given that it’s the first section people read after your header and headline, be sure to include any key achievements, career milestones, awards, endorsements and success stories. Instead of focusing on tasks you completed, focus on the results your actions yielded. Recommendations can help readers understand the types of problems you solve, how you make decisions and how you handle tough situations. Ask supervisors from past jobs and others you have done business with to leave you a recommendation outlining your skills and achievements. Being “top of mind” with potential employers can be very beneficial. Aside from staying in front of them, sharing insights about your career field will show that you are serious about your profession and work to stay current in your field. LinkedIn groups are a great place to connect with potential employers while demonstrating your knowledge on a particular topic. You should search out groups specific to your profession and actively engage in those groups. You may be unknowingly demonstrating your expertise to a future employer. Turn off your account’s activity broadcasts if you don’t want potential employers to know that you are updating your profile. If you are reading this and have just realized your entire profile needs an overhaul, you may want to turn off updates to stay off the radar of potential employers until your profile is ready for action. While the tips above are pretty simple, making sure your profile is professional, up to date and demonstrates your expertise is more than worthwhile when you are looking to change careers. Take a few moments today to make sure your profile is making the first impression you want it to. If you are looking for professional career opportunities, be sure to apply for positions you are interested in and call any of our offices to schedule an interview. Resume writing can be difficult, but, trust us, it doesn’t have to be. All you need is a little time and attention to detail. Follow these tips and soon you’ll be on your way to the job of your dreams! Oftentimes, recruiters receive resumes that are pages long. While you should have a list of all your past jobs, you should never send that list to a prospective employer. Start by writing down every job you’ve had and the major responsibilities from each one. This doesn’t need any special formatting since it’s simply a guide to use while creating your tailored resume. While you’re making the list, it helps to name your supervisors and anyone you worked with who you could use as a reference later. Once you have the information you’re going to include on your resume, you should choose a format. If you don’t already know how to format a resume, you can find templates in Microsoft Word or by searching the internet for resume templates. Find something that looks clean and professional. Your name and contact information should always be at the top of the page. Experience should be next, followed by education and special skills. One you start to write your resume, you’ll want to think about the job you’re applying for, the description of that job and what experience you have that lines up with it. If you worked as an assistant on a construction site, that should be included if you’re applying for a construction job; however, that experience probably isn’t relevant when applying to an administrative or customer service position. The included experience should be tailored to fit each job you apply for. Some exceptions include management positions of any kind or if you don’t have very much job history. Unless you have 20 years of relevant experience, your resume should be one page only. Cut down on irrelevant job duties. For example, if you worked as the manager of a retail store, you don’t need to include that you know how to operate a cash register. Recruiters will be more interested on whether you know how to make schedules, train employees, and control inventory. Give the big picture with the most important details only. So, what details should you include? You should tell the things that make you stand out. Remember, the reviewer is receiving several other resumes. Tell them why they should call you before anyone else. Did you increase sales by 20% at your last store? Did you cut down on packing time in the warehouse? Do you know how to use a special computer program? Let the recruiter know what is unique about you! Make sure to sell yourself and the skills you know, but don’t ever lie. If you only used Adobe Photoshop once in your high school yearbook class, don’t put Expert at Adobe Photoshop on your resume. When you’re asked to prove your skills, you don’t want to embarrass yourself (not to mention, waste your time and the recruiter’s time). Just be honest about what you know and sell those attributes. It will likely land you a job you’re happy with and well-suited for. Most importantly, don’t forget to use proper grammar and spelling throughout your resume. Then, read it over again to make sure it’s all correct. If spelling and grammar aren’t your strongest skills, ask someone else to look at it for you. Finally, Priority Staffing Group is here to help you. Our website has a resume builder that helps you get started. And when you apply with us, we’ll look at your resume and make suggestions for you too. All you have to do is ask! Make an appointment today so that we can get you on your way to a new job! Inappropriate interview attire can cost you the job. But how do you know what’s appropriate to wear? The answer to that question depends on your line of work and the company you’re interviewing at. Answer the following questions to decide how to dress for your next job interview. If you’re applying for a job in a clerical or customer service field, the standard attire is business casual. For men, this means dress slacks, dress shoes, collared shirt and, in some cases, a tie. For women, this means dress pants or a knee length skirt, a modest blouse, heels or flats and professional accessories. Manufacturing or labor positions, while casual in nature, might still require nicer choices for the interview. If applying for a management role, I recommend the above business casual. For everyone else, jeans or khaki pants with a button up or polo shirt with casual (but clean!) shoes is acceptable. What company are you applying for? Do your research! The above guidelines should be used as just that – guidelines. For example, I have a client who needs construction workers and general laborers for his company. What I would normally suggest for a similar company doesn’t work best for his applicants. He would like to know that his applicants can get their hands dirty, and a collared shirt won’t tell him that. For this company, I recommend jeans, a t-shirt and work boots. 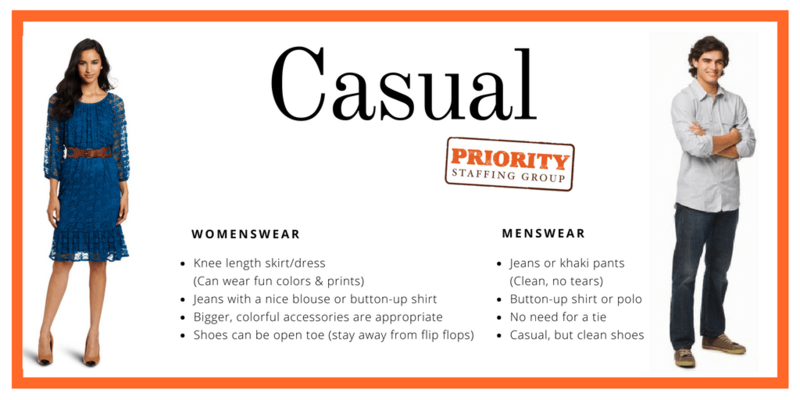 Some research about the company and their current employees can tell you a lot about what you should wear. Rule of thumb: dress for the job you want, not the job you’ve applied for. Are you applying for an entry-level receptionist position, but truly aspire to be in a management role? Dress business professional. Interviewers sometimes connect your appearance to your aspirations. If you wear jeans to an interview, even if it may be appropriate for the job you’re applying for, it might not send the right message to the hiring team. When in doubt, dress a stress up! How do you get clothes? Did you answer the above questions and still don’t know what to wear to your interview? 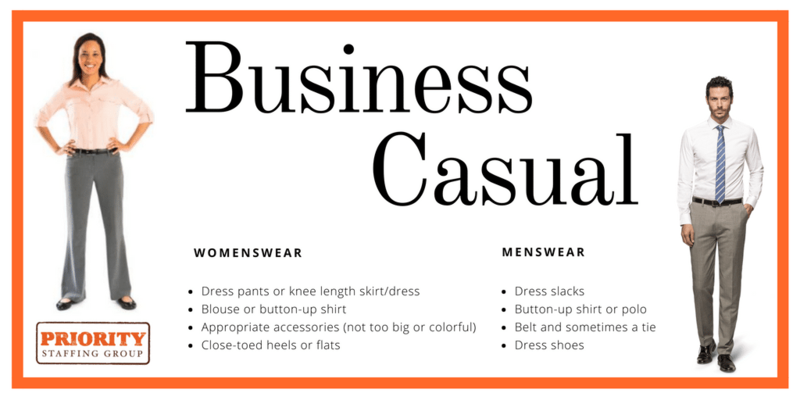 The picture guides above can help you make informed decisions about your interview attire, and many appropriate items can be found in thrift and consignment stores at a reasonable cost. For women interviewing in our Tennessee office who don’t think they can afford appropriate interview clothes, we want to help. Our partnership with Amelia’s Closet in Murfreesboro allows us to help unemployed and low-income women prepare for sustainable employment. This non-profit organization prepares women recovering from hardship by providing an interview outfit and interview tips upon referral from a partner agency like Priority Staffing Group. Upon being hired, they provide returning clients with a week’s wardrobe for work. Ask us for more information by stopping by Priority Group’s Murfreesboro office or calling (615) 295-2127.